Creating a new design classic seems an unlikely move for a TV producer. But Peter Muxlow has always been obsessed with loudspeakers. While creating drama and documentary programmes over a career spanning 25 years, Muxlow also kept up his love of loudspeakers by building them, and writing technical articles for the American magazine Speaker Builder. As a kid he was a self-confessed nerd, and put together at 13 his first speaker  housed in a concrete pipe and not an outstanding success. He began his working life as a technician with Radio New Zealand and then became a television producer. But it was much later, after "the obligatory mid-life crisis", that he decided to follow his dream to create a set of small speakers with a high design content. 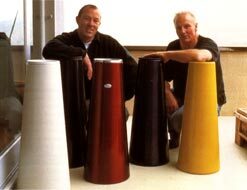 As a result, Muxlow spent two and half years perfecting the elegant Dome speakers, in association with Ross Stevens whose work he saw in a leading design magazine. Stevens, who took off overseas after graduating from Wellington Polytechnic in 1986 to work in England, Scotland, France and Asia, says Muxlow is his favourite client. In a country better know for its agricultural sprayers, it's a refreshing change to design something more timeless he says, "to make products with soul and character, something that will last well physically and aesthetically." The Dome speakers are a far cry from Steven's first project, a urinal for the New Zealand Defence Forces ("my best and most comprehensive design yet!"). With typical Kiwi confidence, Stevens  whose work since has been exhibited and published internationally  sent his portfolio to Philippe Starck and subsequently spent a year working with the designer on a range of television and audio systems. He did design work for three other specialist audio companies before returning in 1994 to teach industrial design at Massey University's School of Design in Wellington New Zealand.